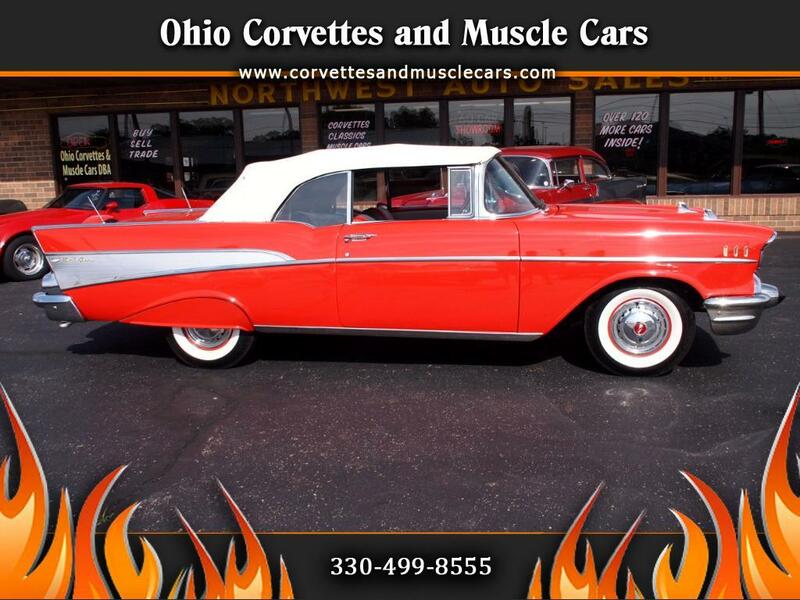 We have just added a very nice 1957 Bel Air convertible to our inventory. This is an older body off frame restoration, but still shows extremely well. It is powered by the 283 small block with the power pack option (4 barrel carb and duel exhaust), and a Power Glide automatic transmission. This car is equipped with power steering and brakes, power top, duel rear antennas, AM push button radio, fender skirts, and Continental Kit. This car just screams 1950s. When you drive it around town you can almost hear John Trivolta and Olivia Newton-John singing You're the One That I Want from the back seat. Check out the pictures of the underneath...done in red oxide paint as was done from the factory, this car is still a good solid #2 car. There a couple small chips around the hood and trunk openings, but the rest of the paint is excellent. Chrome on the underside of the rear bumper is staring to show some age from all the polishing, but all the rest is very nice. The interior still looks new...no rips or tears in the upholstery and the carpet is like new. The top is also in very good condition...back window is clear...no stains...seams are good...no tears anywhere. Mechanically, this car is A-1. Brakes are good...steering is tight...suspension is firm. Ready to drive and enjoy without problems.